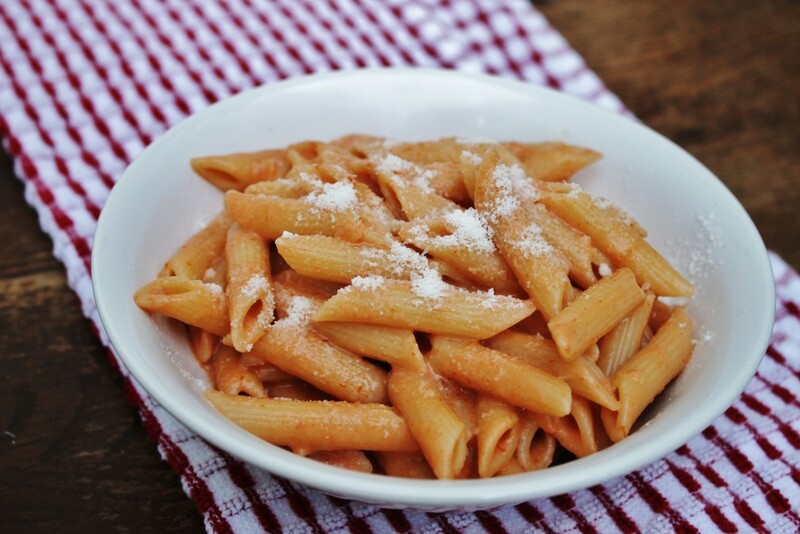 Pasta is my favourite food group. Vodka, on the other hand, is my least favourite liquor. In the prophetic words of Ron Swanson, “clear alcohols are for rich women on diets”. I am neither rich nor on a diet, and much prefer my liquor to not taste like first year regrets, thank you very much. I would like to meet the person responsible for looking at a bottle of Crat and going “you know what this needs? 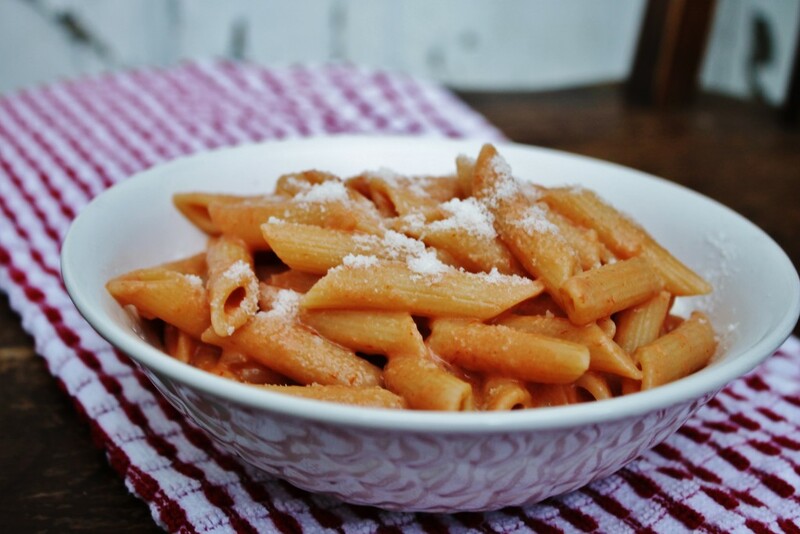 PASTA”. Because you, sir/madam/ghost of Italian grandmas past, are a freaking genius. This is everything you could ever want in a drunk food but could never accomplish because, well, you’re drunk. 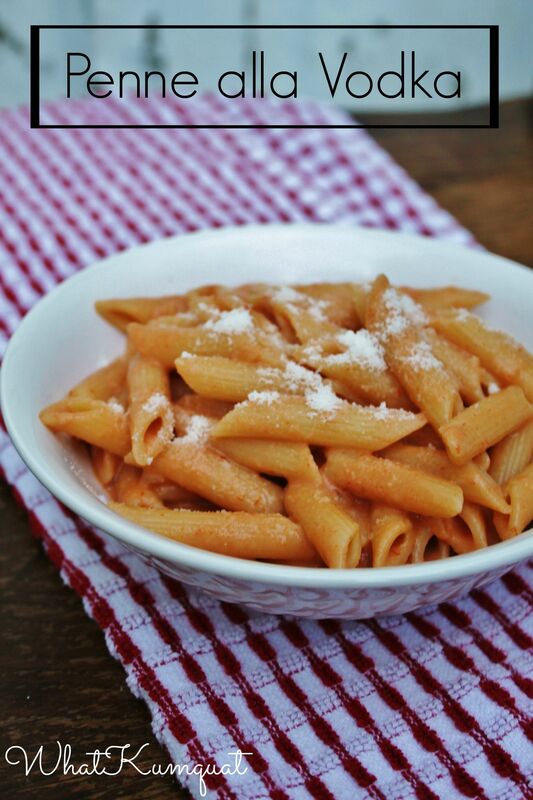 Penne alla vodka is an actually super-well known pasta dish, and for good reason. 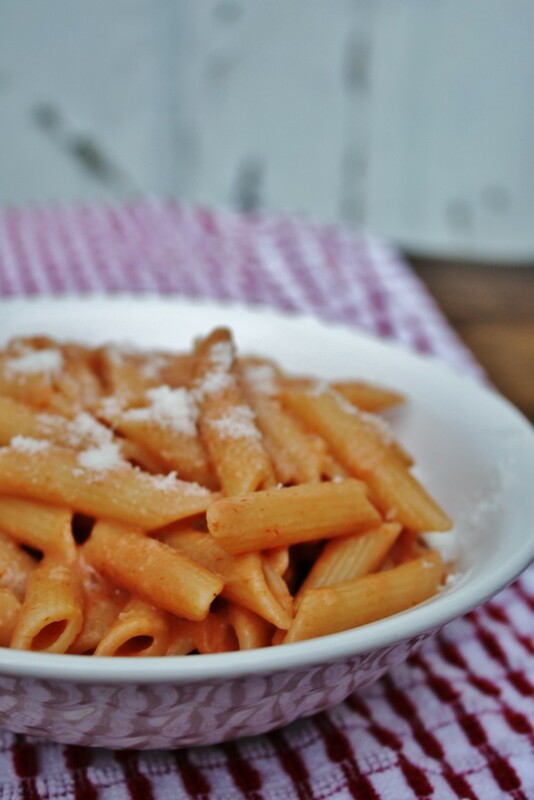 It essentially consists of a creamy tomato sauce, cooked low & slow for about an hour before being combined with shavings of parmigiano, resulting in what is essentially the pasta sauce of your dreams. 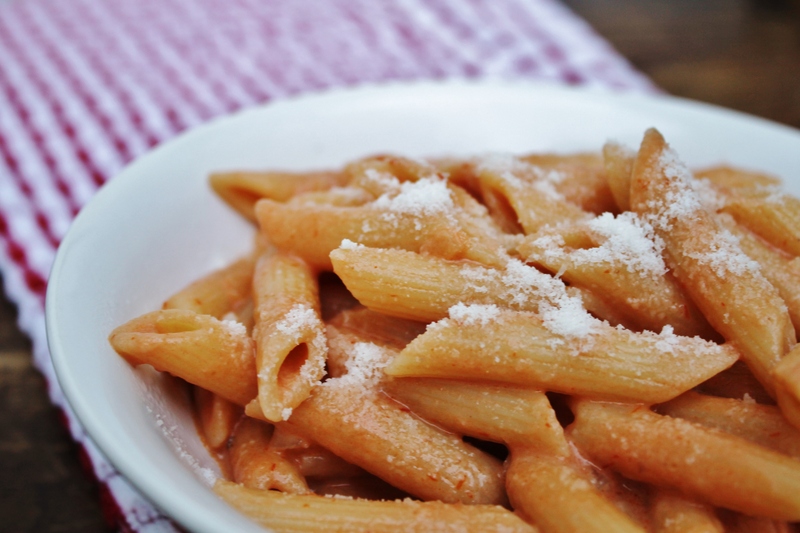 The vodka in the sauce cooks off, so you don’t actually get any of that alcoholic taste. Because, science. The only downside to this is that if you live in America and are under 21 without the possession of a good fake ID, you won’t be able to make this unless you get an elder to buy the vodka for you. I regret to inform you, but “it’s for a pasta dish I’m making! No, really!” is not going to work on the liquor store attendant and you might end up getting arrested for underage possession of alcohol. But let’s hope not, because then you wouldn’t be able to make this heavenly dish. Heat oil and butter in a large pan. When butter is melted, add onion and cook for approximately two minutes. Add garlic and cook until translucent. Season with salt, pepper, and red pepper flakes. Remove from heat and pour in vodka. Return to heat and cook until the alcohol has evaporated (3-5 minutes). Add tomato purée, mix well, and simmer for five minutes. Stir in cream and sugar, then cook at a simmer until it thickens (this can vary, but mine ended up going for a good 20-30 minutes because my kitchen was built in approximately 1734 and NOTHING. WORKS. PROPERLY.). Make sure not to boil! Meanwhile, cook pasta in a large pot. When everything is done, combine the pasta and sauce, then stir in the parmigiano until the mixture is creamy and beautiful and smells incredible and you want to eat your spoon. Garnish with more parmigiano- and no, this is not optional. Cheese is good for the soul. Oh man, that looks so good! I think I might need to make myself some pasta tonight. Yum- I do love a good alcohol-using food recipe! I think the only thing I would need to pick up is some heavy cream…. it is SO good. I want to bathe in it.